You have admired these quilts for years. Now, with this book and DVD, you can design your very own Hawaiian quilt! If you can cut with scissors, you can do this. No special drawing or design skills required. It is that easy! We have been designing and making Hawaiian quilts for over 30 years. 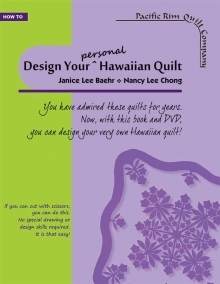 Now, with this book and video, we teach anyone with the desire, how to design their own personal Hawaiian quilt. Join in the tradition of Hawaiian quilting and design your personal pattern. With our help, you can do it. 66-page book: Full of pictures, illustrations and instruction. A handy guide, at your side, as you explore and create. Full-wrap, wire-O binding lays flat on your worktable and displays the book title on the spine when the book is closed and on your bookshelf. 2-hour DVD: Watch as we show you our designing process; be inspired by the surroundings and experiences of our students in Hawai'i as they design their quilts; visit the Bailey House Museum on Maui, and the Grove Farm Homestead on Kaua'i to view a portion of their priceless Hawaiian quilt pattern collections.